Here are my top 8 tips for dog owners. Pet owners the world over spend lots of money on their pets. In America alone, pet owners spend more than 23 Billion dollars annually on things such as pet foods, dog toys, assorted dog related services and veterinary care. I know you don't ever want to skimp on your dog's health or nutritional needs but sometimes you probably feel like you're the number 1 stock holder in the pet industry. So, with that in mind here are my top 8 tips to help stretch your $$ and to save money on your dog. 1. I use these a lot, clip those free store coupons you find in the newspaper and use them on your dog food or other dog items. 2. Use manufacturers' promotional sales as much as you can. Sometimes you might need to send away for the products but in the end the cost will be lower overall. 3. If you can, buy food in the larger sizes and it will be cheaper on an ounce-by-ounce basis. 4. Keep an eye out for ads appearing in your local newspapers for buy-one-and-get-one free promotions and other kinds of sales at your local pet stores. 5. Always save your old towels, quilts, pillow cases, pillows and blankets for your dog to sleep on. These all make great pet bedding. 6. 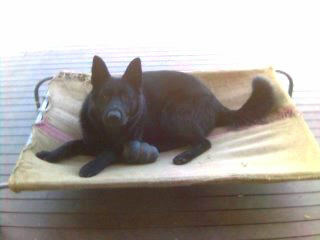 Yard sales and flea markets can be great sources for items that your German shepherd can use. You might find Beds, bowls, quilts, towels, dog crates, toys, and other items. Remember to clean anything you bring home thoroughly before giving it to your dog. 7. When buying a German Shepherd can use. You might find dog bed, remember to purchase dog beds that have washable covers. This will make it easier to clean the bed when needed but also help prevent you having to replace the beds as often since you might just need to replace the cover occasionally. 8. If you can't afford to buy a new bed for your dog, try this. Get an old pillowcase (remember, you're already saving these, see #5 above) and fill it with a soft piece of foam rubber, or one of your old pillows then sew it shut. You will have a new, used, cheap, comfortable dog bed that your dog will enjoy. I hope these top 8 tips help you in saving money on your dogs needs.